The rib cage, also known as thoracic cavity, is an area that is most prone to accidents, and exposed to injury. It surrounds the chest muscles by supporting the shoulder girdle. The rib cage encases a large number of critical organs and pains in this region can be due to an underlying medical condition of these organs. A pain in the chest area is often a cause of alarm due to the possibility of heart pains. However, it is important to understand that not all pains in the rib cage indicate serious medical conditions. Having a proper understanding of what causes pain under left rib cage and surrounding areas can be useful when deciding whether the pain is a negligible matter or a medical emergency. Heartburn or acid reflux - This is a common cause of pain in the left side of the ribs. This may be triggered as a result because of over-consumption of acidic foods or drinks that generally cause heartburn. The pain is sharp and sometimes mistaken as a chest pain. Some may experience a bloated feeling due to lack of stomach acid to break down the food. Spleen irritation - Irritation or rapture of the spleen can also cause discomfort and pain under the left rib cage. Pain in the left shoulder tips is added signs of a spleen rapture or damage. Gas in the colon - Also known as the splenic-flexure syndrome, excessive amounts of gas trapped in the colon can cause pain under the ribcage. Gas in the colon can trigger pain in the left upper abdomen or the lower left chest. A person suffering from such pain should sit in a chair to rid the colon of the trapped air. Consuming food that causes indigestion can contribute to such gases. Costochondritis - This is a condition that results from an infection of cartilages that bond the ribs with the breastbone. This can be the result of a forceful impact of the shoulder and rib cage area or caused by a viral infection. Unbearable pain is experienced near the breastbone as the patient breaths heavily. Costochondritis is often times misunderstood with heart attack because the pain usually erupts from under the breastbone. The condition needs to be diagnosed with a physical examination. Broken rib - If the injury is in the left rib cage, then this can cause an explosive pain in left side under ribs, especially while breathing deeply. It can be diagnosed by taking chest x - rays. Pneumothorax - The lungs collapse due to a rupture in the lung membrane and the air leaks out to the cavity between the lungs and the rib cage causing pain under the rib areas. This is a condition that would need immediate medical attention. Stomach ulcers - A sharp pain under left rib cage can denote an ulcer in the stomach. This can cause pain that move up to the shoulder blade area from the rib cage region. Depending on the severity of the condition, the pain may last only a few minutes or reoccur in intervals. 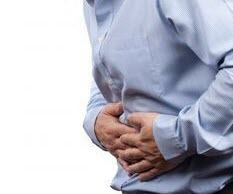 Irritable-bowel syndrome - This is a condition which cause pain in the abdomen, bloating, and cramps. It also disrupts normal bowl movements by causing diarrhea or constipation depending on the affected person. The sharp pains under the rib cage area can result in with the cramps in the intestines. Other conditions that cause pain under left rib cage include diverticulitis, pancreatitis, Intestinal infection, inflammation of the heart sac (pericarditis) and dissection of the abdominal aorta (Aneurysm). Treating pain under left rib cage can be complicated because of the wide variety of possibilities that can be causing the symptoms. Some conditions such as mild muscle inflammations can be treated with a pain killer while broken ribs will need emergency medical attention. A ruptured spleen too will need surgical intervention. In case of being diagnosed of pneumothorax, the treatment will depend upon the severity of the condition and may need insertion of a chest tube. In case of heartburn or acid reflux, medications such as Lansoprazole, Esomeprazole, or Dexlansoprazole as well as changes in the diet can treat the condition. If the pain in the left side under ribs is caused by costochondritis, then medications such as Indocin, Relafen, and OTC pain relievers such as ibrufen can be used in the treatment of pain. If diagnosed with irritable-bowel syndrome, laxatives are recommended while a high-fiber diet would be a long term remedy. Pain in the rib cage area usually results from an external injury or a forceful impact that may have caused internal damage to organs within. Broken ribs can cause excruciating pain in the underside of the ribs. A pain under left rib cage can be a manifestation of an illness or disease affecting the organs that are located in the left side of the rib cage. The urgency of seeking medical assistance depends on how the pain started and how sever or prolonged the pain is. Since a number of critical organs are present within the left side of the rib cage, neglecting pains that are persistent can be very harmful. If persistent pains or sudden and sharp pains are experienced and injuries are sustained to the rib cage, emergency medical assistance should be sought to avoid life threatening conditions.